The Prime Minister welcomed His Majesty Sheikh Hamad Bin Isa Al Khalifa, the King of Bahrain, to Downing Street this afternoon. The Prime Minister reiterated the UK's support for ongoing political reform in Bahrain but encouraged His Majesty to continue to demonstrate substantive progress in all areas. The leaders made clear their commitment to strengthening trade and investment ties between the UK and Bahrain and helping companies from both countries succeed in the global race. They also discussed regional dynamics, including the situation in Egypt, Iran and Syria. On Egypt, both leaders agreed on the need to end violence and find a successful political solution. The Prime Minister welcomed Bahraini plans to begin celebrations to mark 200 years of Bahraini-British relations in 2020 from next year. He thought this illustrated the breadth and strength of the deep rooted relationship. The Gulf has become a focus of sales of the Eurofighter Typhoons which are made by British arms firm BAE Systems, with European airspace groups EADS and Finmeccanica of Italy. BAE signed a £4.5 billion deal with Saudi Arabia in 2007 to supply 72 Typhoon jets to Riyadh, though the contract has faced obstacles over the cost. 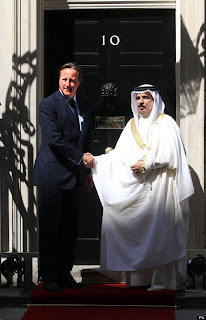 Oman, a Gulf state which like Bahrain has close links to Britain, ordered 12 of the jets last year. BAE also hopes to sell 60 of the jets to the United Arab Emirates, where it is facing competition from the Rafale jet made by France's Dassault Aviation.